Our make up artist will create a look for you and our photographer will take fabulous photos during gorgeous photo shoot which normally lasts from about an hour, sometimes longer. The atmosphere is very relaxed and informal and we make every effort to put you at your ease Let us know before hand what kind of makeover photo shoot you would like - beauty, boudoir, glamour, fashion etc. if possible, come in with your hair ready styled. We can style your hair for you for a small additional fee of £15. High quality makeovers at the London's cheapest prices. Take a look at our makeover portfolio to see a examples of our family pictures. You can also visit Studios4u.co.uk which is our purpose built studio website. Contact us to make a booking. For studio portraits you will need to pay a deposit of £25. This can be done over the phone by credit or debit card or you can pay your deposit online using the link below. Please be aware that if you wish to change or cancel your booking, we need 48 hours notice or you will loose your deposit. Buy a gift voucher for one of our fabulous family photo shoots and we will double the value when you order from our fantastic range of photos and products. 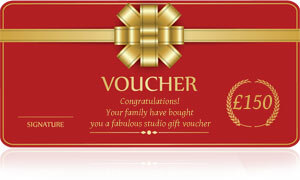 A family portrait gift voucher is a wow factor present with a difference and the photos will be treasured forever. A family photo shoots can last up to one hour and there is no charge for this. You only pay for for what you take on the day. We have a fabulous range of affordable prints and products you can buy.